Credit Union Marketing Center - Credit Union marketing and advertising has never been easier. to Market Your Credit Union. Send camera-ready artwork directly to your local publications and printers. "As a financial marketing consultant, I have never worked with a more service oriented company. Their technology is saving credit unions of all sizes from all over the country valuable time and money, while their compliance approval process is saving even more." "CUMarketingCenter.com is great to use because it is extremely effective in being timely and efficient. The digital signs are useful for weekly news for our television. The pre-designed closed signs make my life easier. It gives me peace of mind knowing that marketing can be done efficiently, effectively and with impact." "I am very pleased with CUMarketingcenter.com. The tool is very user friendly and turnkey. Overall, there is a good balance between ease-of-use and features/functions. The templates provided meet most of our needs at this time, with plenty that we can use in the future. Matt, my go-to support guy at CUMarketingcenter.com has been amazingly helpful, and has been able to further customize projects when necessary. " Our web-based platform puts you in complete control of the marketing production process for your credit union – all for a fraction of your current marketing costs. As a registered user you will have access to thousands of professionally designed marketing materials and over 8 million stock photos. In seconds you will able to create "camera-ready" artwork for publication or printing. Our technology allows credit unions to protect their brand and compliance, while allowing users in the branches to personalize and customize their own ads. 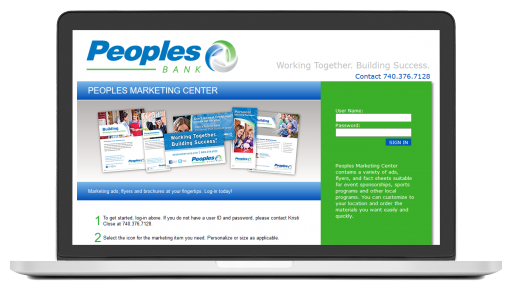 In addition to handling all the creative needs for community credit unions, we also offer private labeled marketing portals for large financial institutions that have their own creative. “BankMarketingCenter.com gives us a customized, decentralized delivery system for our marketing and sales collateral. We’re able to maintain control of our brand image and empower team members at the local level with high quality, professionally created ads and marketing materials they can customize. This has allowed Peoples Bank to do more localized marketing while saving a substantial amount in marketing costs." The order history keeps a digital trail for regulatory audits, including dates and times of compliance approvals. See how Credit Union Marketing Center can save you valuable time and money. Fill out the form to request a personal demo. © 2019 CUMarketingCenter.com. All Rights Reserved.